NOME — So many people died outdoors or vanished here that the FBI searched for signs of a serial killer. Hollywood made a movie blaming space aliens. The truth, federal investigators concluded, was simple and sad. People were coming to Nome and drinking too much, sometimes freezing to death in the wind and cold or disappearing in the waves. Most were men. Most were Alaska Native. In the past decade, however, something has changed in the drinking capital of the Seward Peninsula. Once labeled the boneyard of the Bering Strait region, no one has died outdoors after a winter binge since 2010, according to local police. 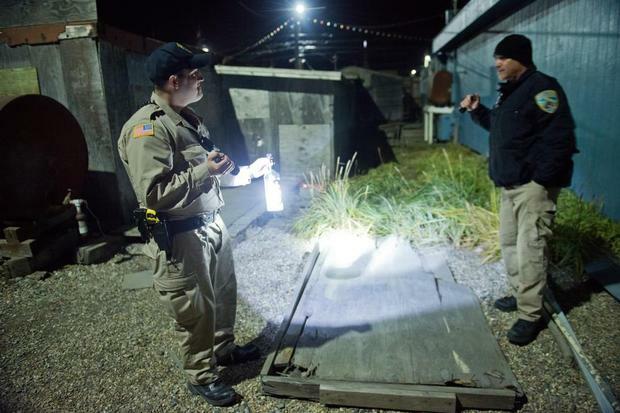 “No one has gone missing in years,” said Nome Mayor Denise Michels. The difference? 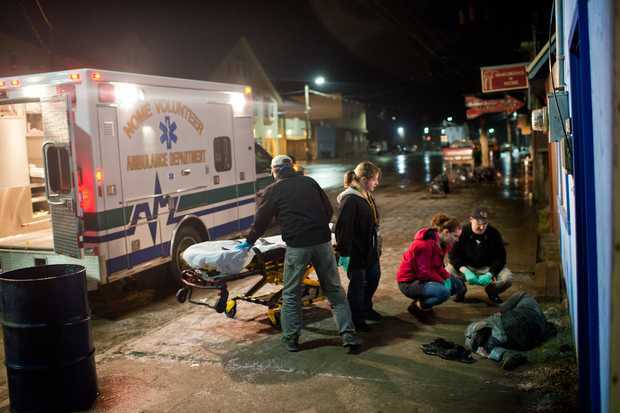 Few Alaska cities have made such an extended, hands-on effort to save the lives of people drinking in their town. • Opened an emergency homeless shelter that last year offered a warm cot and hot meal to more than 162 people, two thirds of them from surrounding villages. 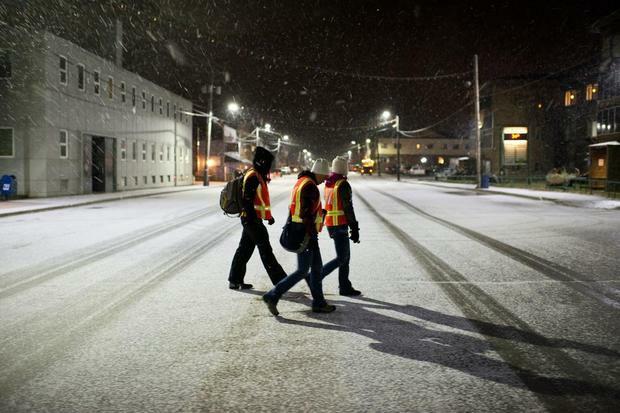 • Launched a volunteer civilian patrol that walks downtown Nome from late at night until early morning, searching for people blacked out during busy drinking times such as Permanent Fund dividend payout weeks, New Year’s and the end of the Iditarod Trail Sled Dog Race. • Added two community service officers who, among other duties, take problem drunks into protective custody and drive them to a friend or family member’s house or to sober up at the jail or emergency room. 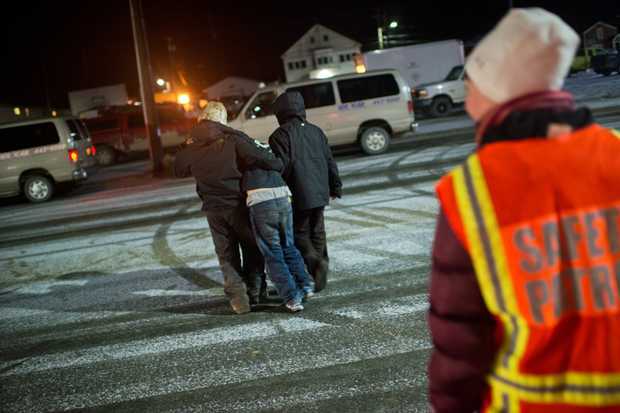 The number of people police took to jail because they were too drunk to take care of themselves dropped by nearly one-third after the shelter began opening every night in the winter of 2011-2012, said Sue Steinacher, director for the Nome Emergency Shelter Team. 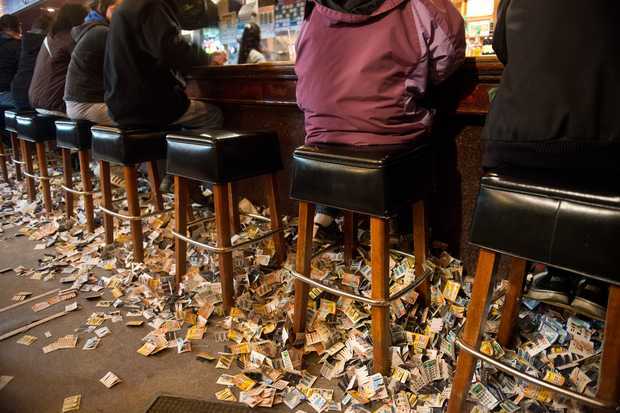 Alcohol-related emergency room visits dropped by a fourth, she said. “People stopped hanging out at the E.R. 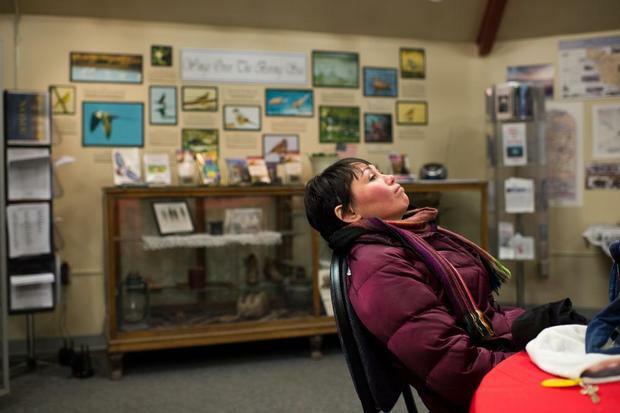 as a way to stay warm.” Michels, the first Alaska Native woman to serve as mayor of this century-old mining town, said measures such as the foot patrols and grass-roots shelter could be used in other hub cities around Alaska. “The model should work anywhere. Just like community policing models or neighborhood watch,” she said. 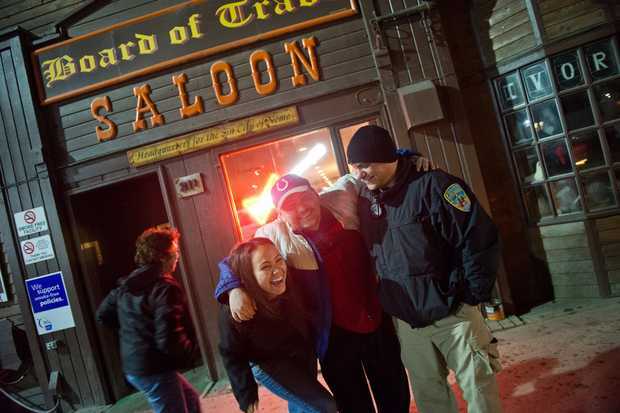 Few efforts are more direct than the unpaid safety patrol, which began late-night rounds on a recent Friday night, hours after the first dividend payments materialized in Alaskans’ online bank accounts. 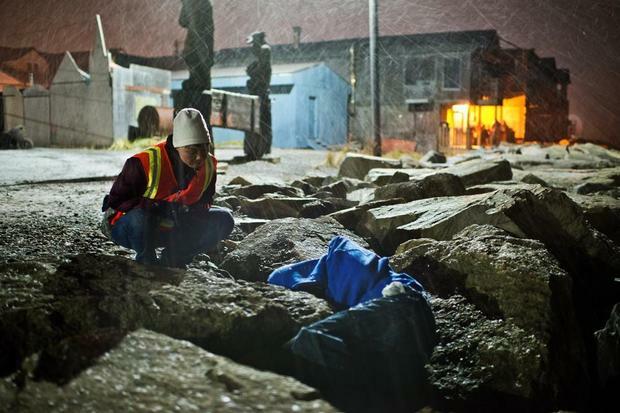 By 1:45 a.m., volunteer Darlene Trigg found a man curled on the seawall, his sweatshirt collecting snow. He slept on the rocks 100 feet from the rumbling Bering Sea surf. Trigg, a 32-year-old employee-relations administrator for Norton Sound Health Corp., plopped down on the boulder beside him. “You look real cold. Maybe you need to go inside,” she said. The man mumbled and cursed in reply, his features hidden under the hood of his sweatshirt. He wore no jacket, no gloves and no hat. The safety patrol’s job is to urge someone who is too drunk to care for themselves to go home. If they refuse, volunteers stay with them until police or medics arrive. When he finally stood, barely able to walk, he looked up to reveal the face of a clean-shaven young man in his teens or early 20s. He was from Unalakleet, he said as police led him away. Trigg retrieved her coffee cup from the rocks and resumed patrol. It was still an hour until closing time at the city’s seaside bars. Nome sprouted 115 years ago when three Scandinavians struck gold in Anvil Creek. Cabins and tents filled with more than 10,000 prospectors, barkeeps, prostitutes and opportunists. The alcohol came with them. Over generations, the treeless city became a shopping, travel and bar-hopping hub for 15 surrounding villages. It was also a place where visitors seemed to disappear, wrote Savoonga tribal council member Delbert Pungowiyi, who said he began pushing for an investigation into the deaths by the late 1990s. Bering Strait villagers had long complained of indifference and hostility from Nome officials. Trust in the police department crumbled in 2003 when an on-duty officer killed a 19-year-old Unalakleet woman, rallying calls for a wider inquiry. The FBI’s behavioral analysis unit agreed to get involved to see if someone was preying on the men. Federal investigators reviewed 24 deaths and disappearances, announcing in 2006 that they found no sign of a killer. The common link, when a link could be found, was a combination of excessive alcohol consumption and the harsh climate. Some might have perished after falling into the cold water of a channel that has since been filled. In the years that followed, people continued to die. “Every winter, one or two people would freeze to death in Nome due to a combination of over-consumption of alcohol, no place to stay and terrible weather,” Steinacher said. In 2009, a well-known street person in Nome was found frozen along the seawall downtown. A tribal council member responded by opening the tribal hall to the homeless one particularly cold night, Steinacher said. That inspired volunteers to begin using a church community hall as an emergency shelter whenever the temperature dropped to 10 below or 20 below with windchill, she said. Now grants from the Alaska Housing Finance Corp. and the state Health Department allow for the expanded shelter to open all winter long. 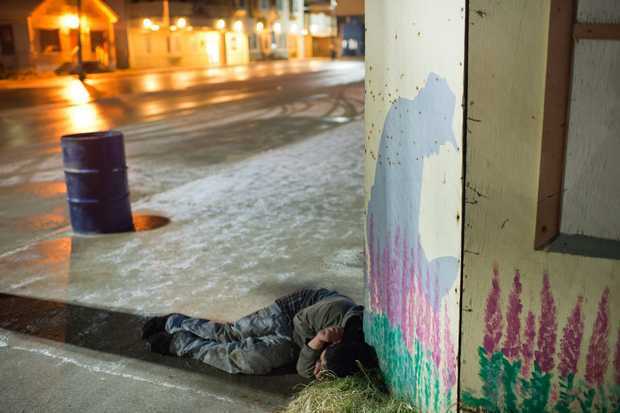 “The state went, ‘You have people sleeping outside when it’s 9-below zero? Oh my God, we need to keep you open every night,’ ” Steinacher said. Some of the paid shelter staff are recovering alcoholics. The Nome bar owners association and hospital, the city government and village groups have all donated money while residents give moose meat, halibut and caribou. When people show up with kids, a local hotel sometimes offers rooms at less than half the usual rate and the shelter pays the bill. Last year, 65 percent of the people who stayed overnight were from one of the neighboring villages, most of which ban alcohol. Some people still die from drinking in Nome, Steinacher said. A man aspirated his own vomit on the beach in the fall of 2011, she said. A 20-year-old Savoonga resident disappeared in October 2010 and was found months later in the harbor. The last time anyone saw him alive, he was intoxicated, police said. The shelter opens for the winter Nov. 15, she said. Gold dredges littered the ocean as Michels steered a city SUV down the beaches just west of town. Excavators hunkered on some of the ships, clawing at the sea floor. Mining permits have nearly doubled in the past two years, the mayor said. A mini, modern gold rush. The Discovery Channel’s “Bering Sea Gold,” a reality show about a few of the dredge crews, inspired some of the would-be miners, Michels said. Soaring gold prices approaching $2,000 an ounce in 2011 did the rest. Even with the injection of blue-collar miners frequenting downtown bars, the city might not deserve its hard-drinking reputation anymore, Michels said. Nome has fewer liquor licenses per capita — one seller per 188 people — than nearly 30 other Alaska communities. The problem, Steinacher said, is binge drinking among those who do imbibe. “People here will start drinking hard liquor shots first thing in the morning and it will go on for days, sometimes weeks, sometimes months,” she said. 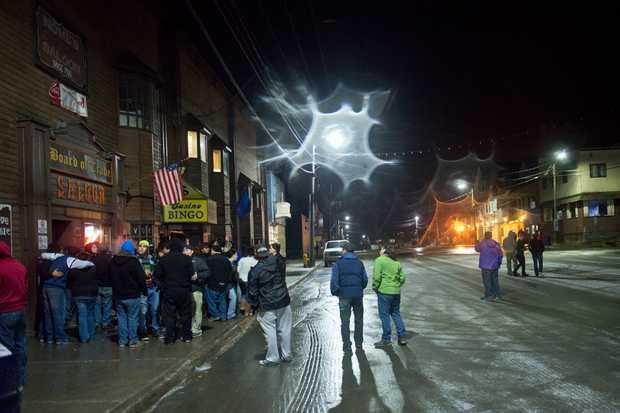 A 2012 community survey found that 33 percent of adults in Nome had not had a drink in the past month, but binge drinking rates in the city were three times as high as in surrounding villages, according to the Bering Strait Community Alcohol Safety Team. The city’s public safety department, including police and ambulance services, gobbles up the single biggest slice of Nome’s annual budget, the city manager said. 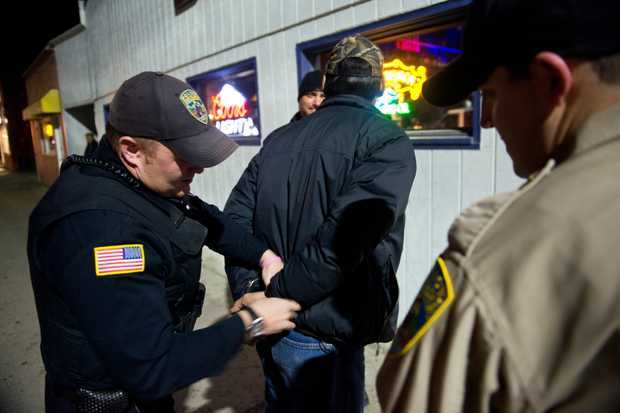 As in all Alaska cities, many of the police calls are alcohol related. 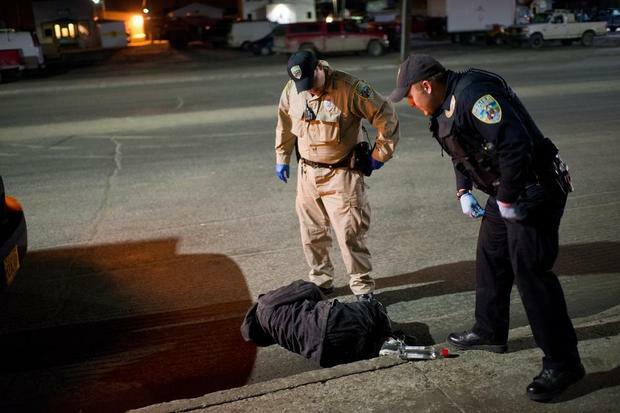 Over a four-month period beginning in June, 110 of 137 arrests in Nome somehow involved booze, said Police Chief John Papasadora. 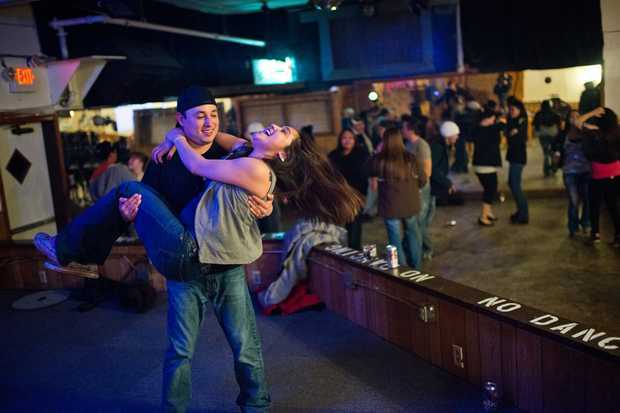 “People call this the Vegas of the northwest region,” said Robert Johnson, a bartender at the Board of Trade saloon. Above the door, a sign reads “Headquarters for the Sin City of Nome.” On the other side of the street, the Iditarod burled arch sits waiting for the annual finish of the 1,000-mile sled dog race. Each year, the Polaris Bar hosts a wet T-shirt contest after the winner arrives. On this night, in early October, a 32-year-old woman from a neighboring village sat at a table drinking a can of beer. She’s lived in Nome the past several months, she said, ever since her boyfriend broke her nose in the village. 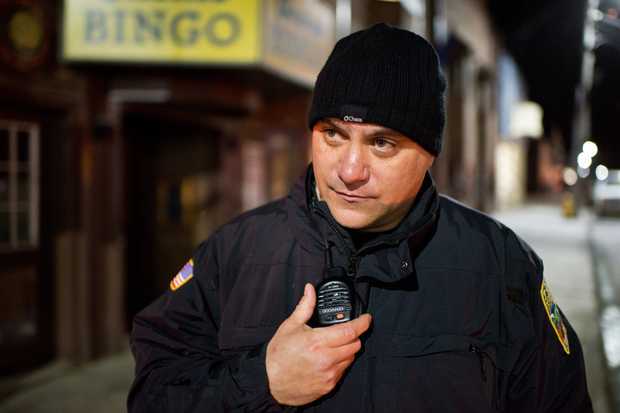 To field some of the roughly 400 “drunk down” calls Nome police receive each year, the city hired community service officer Lance Cannon in 2011. A newer hire helps with the calls and doubles as a dog catcher. If someone has a blood alcohol level of 0.3 or higher, they generally go to the emergency room, Cannon said. The legal limit to drive is 0.08. “My highest I’ve ever seen was a .718,” he said. In the back of his van are two plastic seats with restraints. Some people in Nome call this the paddy wagon. Cannon and fellow CSO Carl Putman spend much of their time on Front Street, where most of the bars are collected along a few blocks. (One of them, Mark’s Soap & Suds, doubles as the city’s only public laundromat.) On the night of the dividend payouts, Putman, strapped a 22-year-old Gambell woman to a chair after someone reported her lying on the sidewalk. Putman told her she was going to the hospital. Later that night, the volunteer safety patrol began. 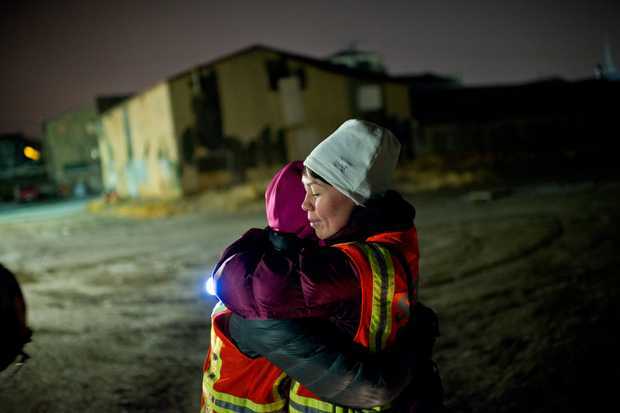 Trigg brought her daughter, 17-year-old Manniq Trigg-Komakhuk, and her daughter’s boyfriend to the downtown Nome visitor center to gather flashlights and reflective vests. Manniq studied the room. Framed photos of historic Nome ringed the walls. Why, she asked her mom, are there only two pictures of Alaska Natives? Other volunteers said they work for the hospital or the local radio station. Trigg said several employers in Nome, including the health corporation where she works, allow people to count their volunteer hours for the safety patrol as work time. She led the group to River Street, the edge of the bar district. “This is where we used to play Eskimo baseball,” she said. Before long, the patrol came across the boy from Unalakleet curled on the seawall behind the bars. More snow fell, painting the sidewalks. Manniq hummed an Inupiaq tune she learned at a summer camp in Fairbanks. It was written in Point Hope, she said, demonstrating Eskimo dance moves with her arms. Outside the Board of Trade, at 2:45 a.m., a man slumped to the ground against the wall as bartenders announced last call. Guys in Carhartt overalls and girls in skinny jeans crowded for the door to David Guetta’s “Work Hard Play Hard.” The patrol made another sweep, aiming flashlights in the alleys. Wind blasted the streets. “Look, there’s a guy right there,” Manniq’s boyfriend said. A man kneeled hidden in the dark, staring queasily at his phone. Trigg asked him to stand up a dozen times. Her daughter watched in silence. “Where are we?” the man asked. Trigg found the last drunk just before 4 a.m. He said he was 19 years old, from Gambell. Another young man with no jacket. His jeans were wet from lying on the icy sidewalk and began to fall off as he flailed from side to side. Manniq waited in the car and talked quietly with her boyfriend. Trigg said she wasn’t surprised to see her daughter upset after her first night on safety patrol. Trigg shoved her hands in her pockets, shivering. One of the community service officers, now off duty, was on his way with a medic. The teen unleashed a stream of profanity, then gave a guttural, pleading scream. Originally published October 29, 2013 by Kyle Hopkins in Anchorage Daily News.